Thomas Hawk has reported on his blog that Yahoo has integrated Flickr photos into its image search. It is an obvious move but has been a long time coming – Yahoo bought Flickr in March 2005. A quick check by searching on UKeiG, though, revealed that Yahoo.com image search includes Flickr but the UK and Ireland version does not. Bureau van Dijk Electronic Publishing (BvDEP) is to add Chinese company information to its range of products. QIN contains information on over 300,000 public and private companies in mainland China and provides three years’ financial history. The information is provided by SinoRating, a division of sinosure, a credit insurer and expert on Chinese business. Additional information is from World’Vest Base, a provider of information on listed companies worldwide. As well as financial data QIN also offers textual information on companies’ activities and will incorporate detailed ownership and corporate structure information as provided on BvDEP’s other products. QIN will be available later this summer but free trials can be pre-ordered via local account managers or by contacting info@bvdep.com. Thanks to Peter Scott picking this up in his Library Blog. “While the former name spoke to one of the many benefits of our functionality, cross-linking across content from hundreds of quality titles from dozens of the best reference publishers, commented John Dove, Credo Reference CEO, “it was far from memorable to those who might hear it for the first time. This made it hard to pass along via word-of-mouth. Our new name speaks to one of the main challenges for online reference publishing, namely how to stand out from the confusing jumble of information and misinformation that today’s online information seeker encounters. I agree that we will no longer have to explain to users what xRefer ‘means’ or how to pronounce it, but I am not sure that many will appreciate the roots of ‘Credo’ (Latin for ‘I believe’) . “Credo? Who’s he – one of the hobbits?” Or imagine what a dissatisfied user might call it by changing the first vowel to one later in the alphabet! Ask has rolled out its new interface on both its .com and .co.uk sites. It is essentially Ask X (see my earlier posting) but Ask appear to have listened to comments on the Ask X minimalist home page. They have brought back the web, images, news and blogs tabs so you can quickly go those sections rather than having to a general search first. Video and shopping options can be added to the list or you can browse all of the categories. There is also a direct link to the Advanced Search options. Ask has gone for personalisation in a big way: you can choose a ‘skin’ from a selection of 11 (I have chosen Golden) and there is a My stuff link in the upper right hand corner. My stuff includes your recent searches (if you have chosen to record them), saved results, my folders and my tags. As you type in your search terms, Ask comes up with suggestions as you type. If you find this irritating you can easily disable it. The results page is very similar to Ask X. The left hand panel includes a search box together with suggestions to Narrow and Expand your search, and Related Names if you searched on a person. 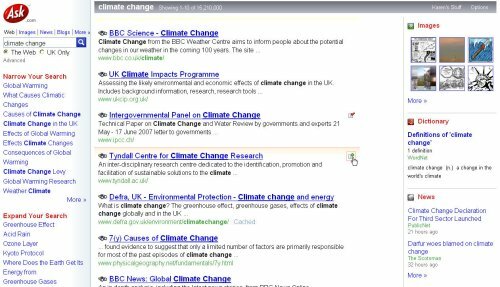 On the right hand side of the screen are sample results from other types of resources including video, news, images, blogs, dictionaries and encyclopaedias. The middle panel contains your search results. Hover over an entry in the list and an icon with green plus sign pops up. Click on this and you can save it to a folder of your choice and tag it in my “My stuff”. Tags are separated by spaces and multi-term tags have to be enclosed in double quotes, for example “climate change”. When you have added a page to “My stuff” the green cross change to a red tick, but the pages are not recognised if they appear in a subsequent search so you could end up saving duplicate pages. Overall, I like the new Ask especially the way it offers information from different types of resources on the results page. There are still some glitches that need attention: my search history does not appear to be working even though it is switched on, and it would be helpful if it recognised pages that you have already saved. Hot on the heels of Exalead’s new face recognition search option, Google has launched a similar feature. Unlike Exalead, which has a ‘Face’ option under ‘Narrow your search’, Google requires you to add &imgtype=face to the end of the URL of your results page. As Phil Bradley says in his blog “A simple button would suffice guys!”. Phil also reports that, although clunky, Google’s face search seems to return more and better results than Exalead’s. My own experience is variable: sometimes Exalead is better, sometimes Google. Which just goes to prove that you really do need to know your way around more than one search engine.